Snail gastropods have wide, a muscular foot, a head with eyes, a mouth and tentacles. 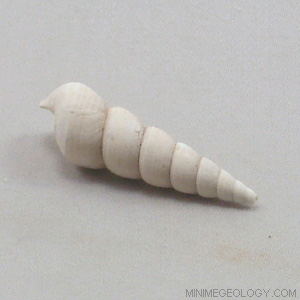 This snail, Turritella Plebia, has a slender, high spiral with incised sutures along the shell. You will enjoy adding these Miocene-age (approximately 5 to 24 million years old) gastropods shell fossils to your collection. These fossil snails are from Calvert County, Maryland. Gastropod snails and form a single, coiled shell with no interior chamber so that they may live in the entire interior space. The shell coils form around an axis giving a spiral shape. Modern relatives of this snail species still exist today.